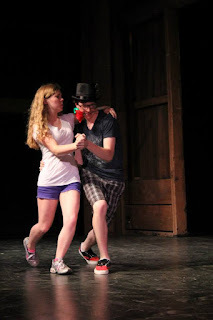 Putnam County Playhouse: GET SHAKESPEARED! ON JUNE 29TH!!! The Bard will take the stage again at Putnam County Playhouse as the SHAKESPEARED! Workshop presents two versions of Shakespeare's tale of mistaken identity The Comedy of Errors. The final results will be on view on Saturday, June 29, at 7 p.m. Tickets will be available only at the door. All tickets are general seating and will be $3. Chldren under twelve will be admitted free. Sponsor for the production is Shuee's Furniture and Mattress. Program director and creator Caroline Good is at the helm of the older group of performers. They include Ethan Gill, Logan Beck, Lucas Eckrich, and Dylan Bodnarick as the two sets of twins. Libby Brush, Joe Lippard, Chloe Maginity, Samantha Flanelly, Madi Egold, Dominique Lafontant, Alex Briones, and Blayne Lackey are also in the cast. Others in the show include George Howard, David Maginity, Maxx Kirk, Colin Dombrowski, Jerica Bean, Abbie Harms, and Clara Lippard. Also appearing are Chloe Bodnarick, Corrine Trigg, Gwen Mazur, Madison King, Caleb Guthrie, Lily Spencer, JenJe Stouder, Michaela Semak, Hilary Johnson, Sammy Batchelor, and Michala Cowley. Working on the technical side for the older group are TJ Tincher, assistant director; Lauren Good, lighting design and operator; Emma Bodnarick and Emma Newton on sound. Good is also assisting Lily Bonwich as costume coordinator. Bethany Bax is directing the middle school group. Appearing as the two sets of twins are Donovan Asbell and Addison Hughes, and their counterpoints Karl Egold and Ben Parsons. Other major roles are being taken by Michael Thede, Jevor Stouder, Corinne Buchanan, and Susanna Howard. Joining them will be Rose White, Sal Martoglio, Luke Norris, Savannah Sanders, and Zach Cowley. 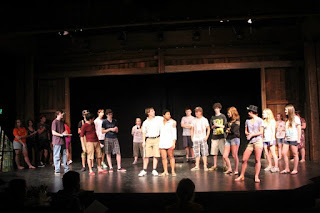 The cast also includes Paxton Wells, Shianna Alexander, Hannah Williams, Grant Pettit, and Oliver Mackenzie. Rounding our the cast are Charlie Good, Gabby Roberts, Allison Staples, and Hope Roberts. The backstage crew for this production are Cecily Girton and Ragan Bax. Tincher, Eleanor Howard, and Ashlee Vitz are assistant directors. Not sure what the plot of the play is? Click HERE to learn about The Comedy of Errors in just about a minute or so.